It is difficult to develop a view on evolution of the global LNG market over the next decade without a clear understanding of Chinese demand. As is often the case with China, the headline numbers are startling. If the penetration of gas increased by just 1% in China’s primary energy consumption (from 4 to 5%) it would mean an increase of approximately 27bcma of gas demand. If that volume were to be met by LNG alone, it would mean an increase in imports of 20MT per year. However the underlying drivers of Chinese demand are more complex. The volume and timing of China’s influence on global LNG demand is subject to considerable uncertainty given the complex interaction between a range of factors driving China’s import demand. It is difficult to develop a view on the evolution of the global LNG market over the next decade without a clear understanding of Chinese demand. China is opening three new regasification terminals in 2012 and is predicted to become the world’s second largest LNG importer by 2020 (second only to Japan). As is often the case with China, the headline numbers are startling. If the penetration of gas increased by just 1% in China’s primary energy consumption (from 4 to 5%) it would mean an increase of approximately 27bcma of gas demand. If that volume were to be met by LNG alone, it would mean an increase in imports of 20MT per year. However the underlying drivers of Chinese LNG demand are more complex. The volume and timing of China’s influence on global demand is subject to considerable uncertainty given the complex interaction between a range of factors driving China’s import demand. These are summarised in the diagram below. The primary drivers of Chinese gas demand (as distinct from LNG demand) will be the rate and energy intensity of economic growth and the degree to which stricter environmental policies result in a switch from coal fired power generation to gas. The jury is currently out on the sustainability of the miracle of Chinese economic growth. Behind what appears to be a steady 8-10% annual growth rate (often extrapolated by analysts into the distant future), there is a more uncertain backdrop. China’s growth over the last two decades has been driven to a large extent by exports to debt fuelled consumers in developed economies. That growth model has been fundamentally compromised by the global credit bust and onset of the financial crisis. Chinese growth since 2009 has been supported by government stimulus (both fiscal and monetary) and there is strong evidence that this growth has been focused on the energy intensive development of infrastructure and industrial over capacity. In the last year the Chinese government has shifted its focus to deflating a domestic property and credit bubble, both bi-products of its stimulus policies. To sustain current growth rates, China either needs a strong recovery in developed economy growth to spur export demand or a rapid increase in domestic consumption. It takes considerable optimism to build a clear case around either of these scenarios. A shock or slowdown in Chinese economic growth will have a strong adverse impact on China’s gas demand growth. China has signalled its clear intention to increase the share of gas fired plant in its power sector. The key factor driving this is concern over local pollution levels (rather than global carbon emissions) given the impact of coal plant on air pollution. As is currently the case in Europe, Chinese coal fired generation is significantly cheaper than gas on a marginal cost basis. So the recent evidence of a slowdown in Chinese growth, creates considerable uncertainty as to the extent to which the government will continue to promote investment in cleaner but more expensive gas fired generation. On top of the broader drivers of Chinese gas demand, alternatives sources of gas supply will be important in determining Chinese LNG demand. The Chinese resource ministry recently announced that it estimated more than 25 tcm of Chinese shale gas reserves which, if accurate, would be the world’s largest reserve base. But the timing and volume of reserves that can be brought to market is much less clear. After domestic production is netted off demand, LNG imports will compete with incremental pipeline imports from Turkmenistan, Kazakhstan, Myanmar and Russia adding a geopolitical dynamic. An added complexity will be the extent to which the lifting of domestic price controls will allow importers to pass on market prices to consumers. Effective analysis of the interaction between drivers of Chinese LNG demand requires recognition of the uncertainty involved. Simple forecasts or scenarios are unlikely to do the problem justice. 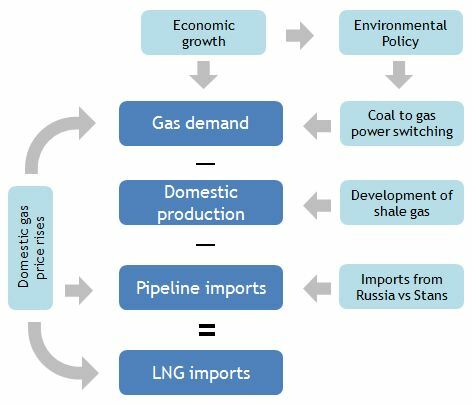 Instead an analytical framework is required that captures the interaction between macro drivers of Chinese gas demand (economic growth rates, energy intensity, gas penetration) with domestic factors influencing demand growth for LNG as a complement to alternative sources of gas supply. Developing an effective analytical framework, based around the factors illustrated in the diagram, should facilitate more meaningful analysis to confront the uncertainty associated with Chinese LNG demand growth.